It’s been well documented the excessive prices pre sale condos have been able to garner in Vancouver, and more recently in Ontario. As prices have escalated, and land values have soared, everyone has begun speculating on ever higher prices. This has made land banking a lucrative option, aided in part by record low interest rates which have allowed holding for longer periods of time to be much more feasible. With this, developers are paying a premium for land. Such as the recent sale of the high profile White Spot on W Georgia which garnered a jaw dropping sale price of $245 million, making it more than $615 per buildable square foot. In order to squeeze out any profit, developers are having to maximize density and prices. As a result, new developments are pricing in future expectations, and charging anywhere from 20-30% above current market value. Take for example a recent project on Main Street which was asking $1300-$1400 per square foot. Meanwhile, nearby buildings that are only a couple years old are selling for, on average, $1100/ square foot on the re sale market. Second + Main Price sheet. 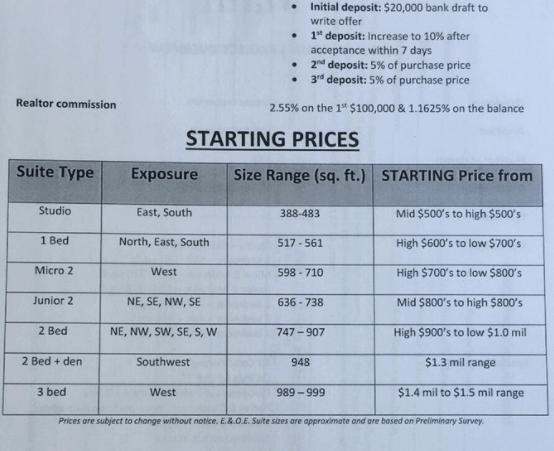 I’ve often wondered how things would shake out if buyers of these pre sale units don’t realize their profits. Or in other words, if prices flatline or decline, what would they do? It looks like we are beginning to see the first signs of that in Ontario. A project in the Whitby area has recently begun selling phase 2 of their project for up to $90,000 cheaper than they sold phase 1. Which is now being referred to as ‘reverse sticker shock’. Last January, Astrid Poei and her husband Sheldon Fisher purchased into phase 1 only to see identical units in phase 2 sell for $75,000 less. The disgruntled buyers are looking for recourse. Dionne Thompson, who also bought in Phase 1, is discovering investments don’t always go one direction. According to Brad Carr, the president of Mattamy Homes Canada, and developer of the Whitby project, early buyers are being offered up to a $30,000 discount if they are willing to increase their deposits. Of course, this could get even more complicated when pre sale assignments are involved. Original buyers who have flipped a pre sale prior to completion have created a domino effect where the legal implications could get messy. This will be a space to watch in the coming years as buyers and developers look to make whole on their investment.